I am fascinated by why people travel or, more particularly the journeys they make in life. 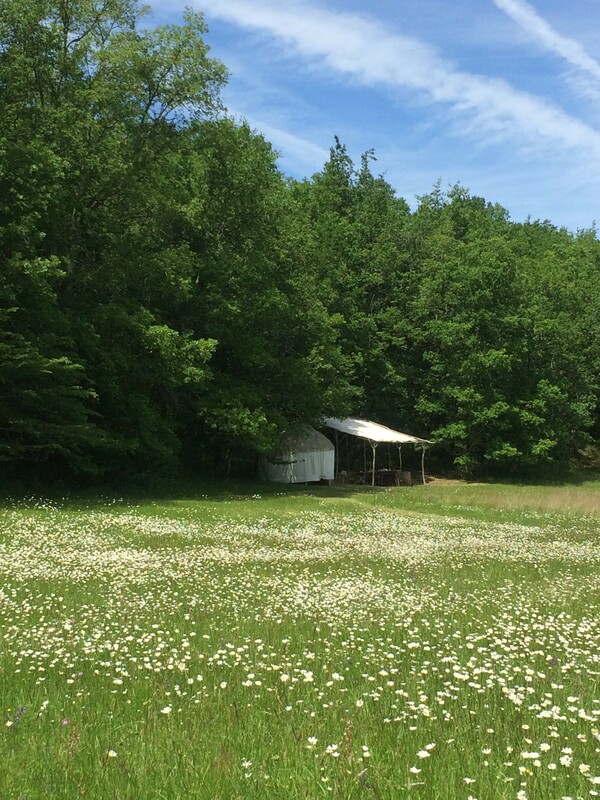 It has taken me almost ten years to make it to Ecovallée, a rather special yurt camp that I heard about way back then in the Dordogne region of France. Mind you, it was worth the wait. Alex Crowe, who left a corporate life in the UK a decade ago to live a truly sustainable life, off the land in, rather aptly, Lalinde, has been on his eco odyssey as long as I have. He has been digging and planting his beautiful holding, and I have been digging for responsible tourism stories and ploughing my way through the world of travel journalism. During these ten years, we have both seen a lot of water pass under that bridge. Politically, socially economically and personally, and we are both still standing. In terms of yurt camps and that somewhat overused term, glamping, I have seen them come and go. Yurts are two a penny in the UK now, and glamping has been colonised by the Cath Kidstonites of the world. The last time I tried to pitch a glamping story to an editor, I was told that they were glamped out. The reason Ecovallée is still here is because it is the real thing. Alex lives on site in two adjoined yurts, one his living space and the other his sleep space. 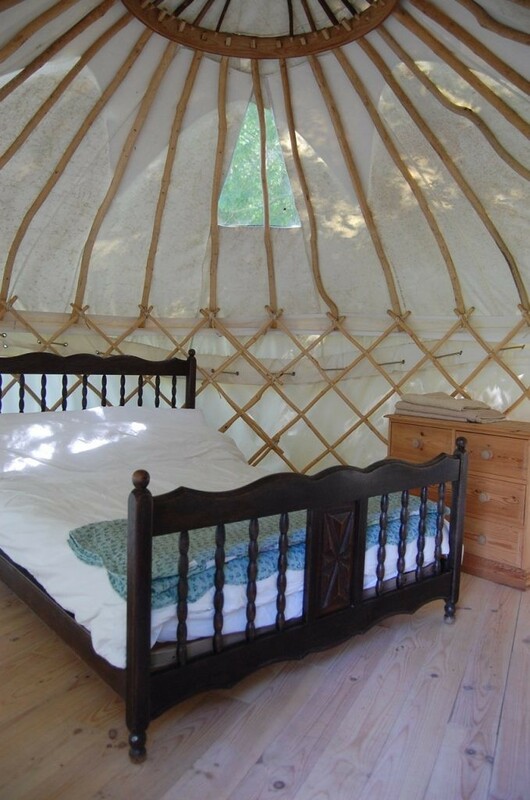 Quite separate from his home are two other 12 foot yurts, with comfy beds and lovely white linen, for guests. He is certainly living the dream but he will be the first to tell you that sometimes the dreams can veer towards nightmares. 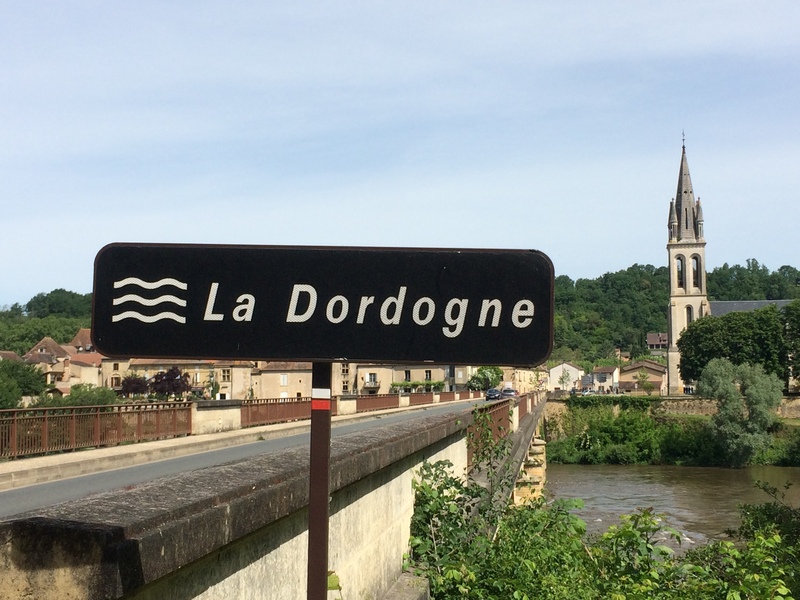 The tourist season is short, the Dordogne gets cold in winter and dealing with French authorities can finish off even the hardiest dream seeker. But this is his life now, not a dream, and sharing that for a long weekend was gloriously reassuring that truly responsible tourism still exists. That sustainable living is possible. And, that tranquil, spacious yurt camps still exist. Sans Kidston. Descending from Alex’s home yurts through his hazel and acacia woodland, the land opens up into a wildflower filled meadow, where the guest yurts are perfectly placed with plenty of space between them. There are also outdoor kitchens, an outdoor solar shower and a compost loo. All in the shade of trees that envelop the meadow, proffering views up to the kites and hawks that soar up above by day, and the star studded sky that glistens at night. I had the place to myself all weekend and, although travelling solo and relatively adventurous, I must admit my heart was racing just a little as I descended down through the woodland in the dark to find my bed for the night. But then, as I emerged into the valley, the whole place lit up as if someone had put the fairy lights on everywhere. And my heart quite simply missed a beat. I had never seen stars like it. Alex is the main star here, however, as he lives by his principles, many of which are informed not only by sustainable living practices but also by the popular spiritual thinker, Eckhart Tolle. After ten years, I finally found myself at Ecovallée after a personally difficult time, and a period of intense grieving. And knowing that Alex has now stripped his site back from a family campsite with several yurts to a smaller adult only retreat with just the two yurts now, it felt that the time was right. Because this really is the place to go if you want peace, plenty of space, a place to do yoga or meditation, or just breathe. As Eckhart Tolle says, (I borrowed Alex’s well leafed book) “Pleasure is always derived from something outside you, whereas joy arises from within.” And waking up to the sound of the dawn chorus all around, stepping outside my yurt to a mist filled meadow, making coffee on the outdoor cooker and allowing myself to wake up slowly in the hammock while a young deer appeared tentatively through the mist, I certainly felt a moment of pure joy. See Ecovallee.com for more details. You can travel here by train to Lalinde, the nearest town which is about twenty minutes’ walk away, although be warned, it is a steep uphill walk for the last ten. But a divine walk. My favourite site, by far, for booking European rail travel is Loco2. You can also fly to Bergerac airport, just 20km away with some super cheap offers if you keep an eye out. I got one for £30 return. In May. For yummy boulangeries, epiceries, cafes and a little supermarket, you can easily walk into Lalinde. There is a tourist office there too for more information on the region. Hikers note that Lalinde is on the Grande Randonnée long distance walking trail GR6. And Ecovallée would make the perfect rest place along your journey. 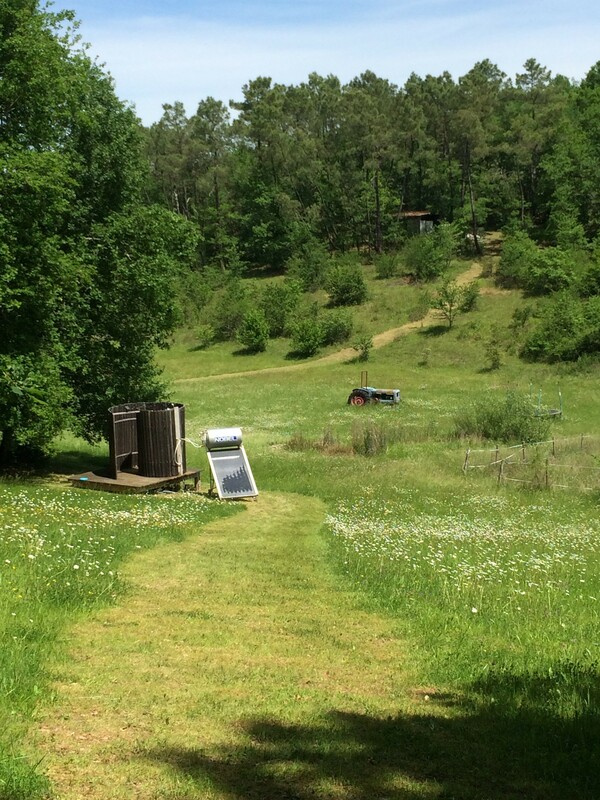 This entry was posted in Articles and tagged adult only campsites, agritourisme, Camping in the Dordogne, eco France, French agritourism, glamping in France, living off grid, rewilding, tourisme durable, wellness retreats, yurts in france. Bookmark the permalink.